Colorado Guest Ranches offer vacation packages via horseback with beautiful, spacious lodges where all of your meals are provided. Once on the dude or guest ranch, you are invited to participate in any of the activities at your leisure. You'll love horseback riding in the eastern plains or the majestic Rocky Mountains, year-round, in Colorado. An historic establishment first opened in 1886, abounding in Western character & charm. The Northfork of the Cache La Poudre river winds through our ranch. Remote; yet easily accessible from Denver. Riding for all ability levels! Over 128 horses with just the right personality for you. Come find your wilderness! You won't want to leave. Our guests arrive as strangers and leave as friends. Family fun abounds at Colorado Trails Ranch located in the beautiful San Juan Mountains just outside of Durango, Colorado. 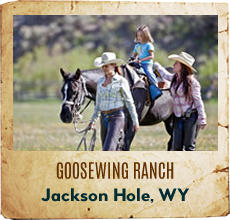 With its comprehensive Western riding and children's programs plus some of the best fly-fishing, the ranch offers an array of activities for the entire family. You'll find that we tailor riding our program to accommodate all ability levels. If you're a new rider, we'll teach you the basics; if you're an experienced rider, you will appreciate the quality of our horses and the opportunity to do more than just "nose-to-tail" trail rides. In addition to riding and fishing, we offer shooting sports, rafting, hiking, swimming, evening programs, cozy cabins, delightful food and the best staff around! Music Meadows is a 4,000 acre cattle ranch in Southern Colorado's majestic Wet Mountain Valley. Your "Home on the Range" is family size, updated but dating from the early 1900's. Not a lot of amenities... but good horses, beautiful country, patient instruction, and peace and quiet will mark your stay here. Here you are taught to ride "out of line... not down a trail"! Vista Verde Ranch (VVR) is a truly unique ranch experience for all seasons. Enjoy gourmet meals and relax in a luxurious log cabin or lodge room. Activities include horseback riding, hiking, rock climbing, fly fishing, rafting, cross country skiing, snowshoeing, sleigh rides, downhill skiing, wine tasting and more. One of the country's foremost guest ranches, the C Lazy U Ranch falls somewhere between a world-class resort and secluded high country retreat where scenery and guest services exceed your wildest expectations. 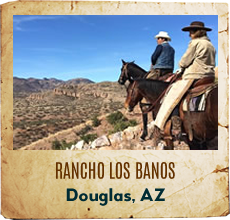 The Ranch is Miles Above Ordinary and has preserved the traditions of the Great American West for over 90 years. We welcome you to come visit our family. Colorado's only Relais and Chateaux affiliated guest ranch, The Home Ranch is located north of Steamboat Springs in the pristine Elk River Valley along the western continental divide. The ranch offers 14 guest accommodations, our 'haut mountain cuisine' utilizing ranch raised and grown beef, pork, poultry and produce, and a breadth of activities including riding, fly-fishing, hiking and more. 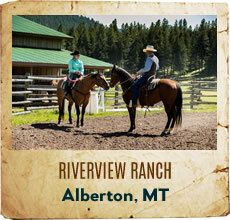 Welcome to Tumbling River Ranch, one of the finest guest ranches in the Colorado Rockies. We have a long-established tradition of giving guests what they expect. A superb location, nestled in a secluded valley high in the heart of the Rocky Mountains, surrounded by cascading streams, abundant big game, wildflowers and trees... exciting activities, including trout fishing, swimming, invigorating hiking, horseback riding along extraordinarily secluded and scenic trails, trapshooting, river rafting, plus terrific programs for kids of all ages. 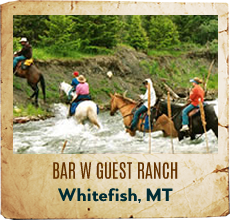 The 4UR Ranch is an exclusive family fly fishing ranch and hot springs resort in the San Juan Mountains of Colorado and has been welcoming guests since the late 1880's. It offers over 6 miles of private tail water, a natural horsemanship program for all riders and exquisite cuisine prepared by their Le Cordon Bleu trained chef. At the 4UR you will arrive as guest and leave as family. Located at 8,412' in the Colorado Rockies. The Taylor River runs through the ranch. Three plans to choose from. 150 guest capacity, 37 cabins, 19 with kitchens. Great horse program, unbelievable fly fishing, exciting whitewater rafting, fantastic rock climbing. Western gourmet food, nightly entertainment. Three night minimum, start your vacation any day of the week. Western hospitality at its finest. 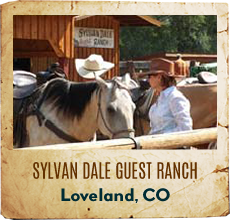 Summer Family Dude Ranch; Fall, Winter & Spring Country Lodge with Horseback Riding, only 100 miles NW of Denver, yet lost in the quiet beauty of the mountains - we love living here, and we love guests! Families play together and make memories of shared adventures. Summer horseback riding, mountain hiking, seasonal white-water rafting, jeep trips, trout fishing, bicycles, a game of pool, ping pong table, horseshoes, or enjoying a book on a sunny porch. Northern Colorado's Historic Rawah Ranch is a Colorado guest ranch located in one of the most scenic and unspoiled valleys in North America. Rawah Ranch's all-inclusive vacations cover Best-of-the-West activities and amenities, gourmet cuisine, luxurious cabin lodging and memories that last a lifetime. 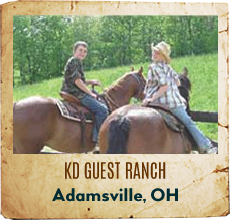 We are a full service working guest and cattle ranch. Rather than a rigid schedule we offer activities in the most flexible way possible. We want you to choose what you want to do, when you want to do it and whom you want to do it with. Rafting, cattle drives every week, unlimited riding, pack rips, shooting, fishing and more. Fully licensed saloon. Call for a free DVD that tells the story! The moment you arrive you will want to linger forever on the front porch soaking in the breathtaking view. Skilled wranglers instruct beginner through advanced riders - family rids, sunset rides, breakfast rides, loping rides, cattle roundups, team penning, overnight pack trips. Two hundred miles of mountain trails wander through lush aspen groves and expanses of wildflowers to remote beaver ponds or high vistas. Flyfish, raft, dance, hike, or just relax. Offering refined luxury with the rustic charm and inspiration of a wilderness enclave. Surrounded by over 100,000 acres of National Forest, indulge in a private escape in beautifully appointed cabins featuring rich furnishings and modern amenities. 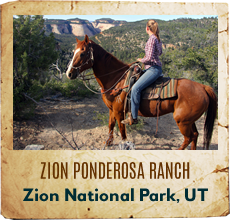 Fly fish in pristine mountain lakes, hike and bike scenic trails or explore mountains on horseback. The ultimate all-inclusive experience. With a unique location 9000 ft up in the southern Colorado Rockies, but within easy reach of glorious New Mexico, Rainbow Trout provides the best of the old west and the southwest. 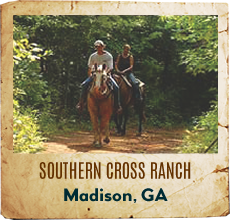 Excellent riding, fishing, kids programs, activities, historic lodge, quaint cabins, and spectacular scenery combine to provide the ultimate family vacation. Join us for a week and take home a lifetime of memories. 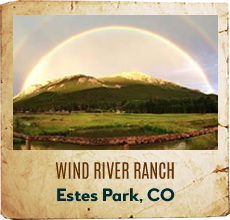 Nestled in the majestic mountains of Colorado, Wind River Ranch offers a peaceful and beautiful setting for you and your family to enjoy a break from the busyness of life. We take care of all the details so that you have plenty of time to focus on relaxing and renewing in an uplifting, Christian environment. Although horseback riding is the favorite activity, it is by no means the only activity. We also offer a climbing wall and zip-line, fly fishing, lake kayaking, rafting, golfing, hiking, as well as our many onsite activities; square dances, hootenannies, rodeos etc. Visit our website to start planning your vacation today! Colorado's highest guest ranch at 9600 feet. Unique for spectacular location, adjacent to Browns Canyon National Monument, excellent riding program, variety of activities, value, superb menu and intimate capacity. Thrilling full-day whitewater raft trip, trapshooting, marksmanship, archery, fishing, van trip to Aspen, mountain biking, hayride, square-dancing, evening entertainment, Jacuzzi and Browns Canyon Adventure Park ropes course. Massage is available for an additional charge. Families encouraged to spend time together. Adults-only in September. The Murphy family's home and passion since 1985. Full service resort experience with stand alone Ranch property located south of Grand Junction on scenic by-way 141. Ranch packages are all inclusive. Other activities include UTV tours, hiking, fly fishing, helicopter tours. Full service spa and resort amenities also available. 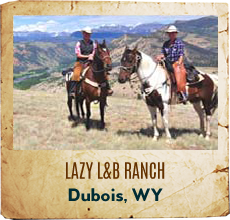 Opened in 1912, Bar Lazy J is considered the oldest continuously operating guest ranch in Colorado. We believe our ranch to be ideally located just southwest of Rocky Mountain National Park and nestled in a peaceful valley on the Colorado River. With a guest capacity of 42 we offer our guests a friendly, informal atmosphere and a true "western experience". Two hours from Denver in a secluded mountain valley, the 600 acre Drowsy Water Ranch offers an outstanding horse program for all abilities of riders with half-day, instruction, all day, loping or walking rides, cattle penning, counseled kids programs, along with hiking, mountain biking, rafting, country dancing, hayrides, delicious family-style meals, daily maid service and evening entertainment.